Ticket barriers may be on the way at Market Harborough Railway Station. Though they are not part of the planned £46million re-design, a letter to Harborough District Council warns they could be installed later. Ticket barriers help prevent fair dodgers, of course. 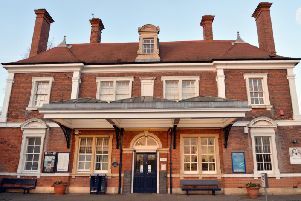 But they also prevent helping granny with her bags up the slope from the ticket office - which will remain where it is in the 1884 listed building - and on to the platform. The big rebuilding plan centres on a straightening of the railway line as it passes through Market Harborough. New extended platforms will be built, and the awkward step up to trains will be reduced. A new footbridge across the railway line, including lifts, will make both town platforms more accessible. The main car parking area will move across to the other side of the railway. Network Rail must apply to the district council for approval of all of its plans. However an 1845 Railways Act means the council has limited powers for refusing the Network Rail plan - even if they wanted to.